If desired, peel pears. Cut pears into quarters and remove cores. Cut pear quarters into chunks. 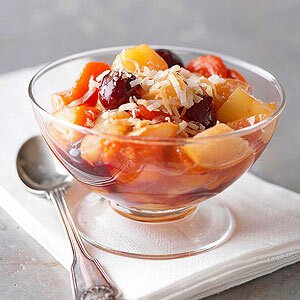 In a 3 1/2- or 4-quart slow cooker combine pears, pineapple, apricots, orange juice concentrate, brown sugar, tapioca, and ginger. Cover and cook on low-heat setting for 6 to 8 hours or on high-heat setting for 3 to 4 hours. Stir in cherries. Serve warm. Top each serving with coconut and nuts.